Laid down for the Royal Navy on 15 April 1943 and launched in 1945 she was nearing completion when construction was virtually brought to a halt at the end of wartime hostilities. In 1946, work progressed slowly and many lessons learnt during the war were incorporated into the ship’s modernisation programme. In 1947, when the Commonwealth Government decided to acquire two aircraft carriers for the Royal Australian Navy (RAN) it was decided that two of the Majestic class, Terrible and Majestic, would be taken over by the RAN and named Sydney (III) and Melbourne respectively. Work resumed on Majestic in 1949 at which time it was decided to increase the size of the flight deck lifts to accommodate the larger aircraft coming into service. 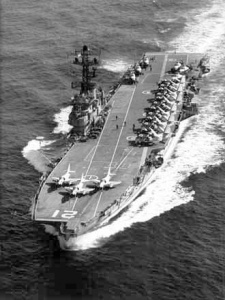 In 1952, a modified angled flight deck of 5 ½ degrees was added as was a steam catapult and mirror landing system. On 28 October, 1955, the ship was officially named and commissioned into the RAN as HMAS Melbourne under the command of CAPT Galfrey G.O. Gatacre DSO, DSC, RAN. Lady White, wife of Sir Thomas White, the then Australian High Commissioner in the United Kingdom, performed the naming ceremony. The first aircraft to touch down on Melbourne’s flight deck was a Westland Whirlwind helicopter of the Royal Navy on 6 December 1955. Not long afterwards the first fixed-wing aircraft, a Hawker De Havilland Sea Venom and a Fairy Gannet, arrived during trials in the English Channel. Following acceptance and work-up trials in the United Kingdom, Melbourne sailed from Glasgow for Australia on 11 March 1956 with 808 Squadron (Sea Venom all-weather fighters) and 816 & 817 Squadrons (Gannet anti-submarine aircraft) embarked. Her voyage to Australia was by way of the Mediterranean Sea and included visits to Gibraltar, Naples and Malta before transiting through the Suez Canal. On 10 April she visited Colombo before crossing the Indian Ocean and arriving in her first Australian port, Fremantle, on 23 April 1956. Melbourne received a warm and colourful reception in Western Australia and there was great media interest in her arrival. In her captain’s first television and press interviews much was made of the revelation that Melbourne possessed the ability to operate her jet aircraft by night as well as by day. This gave Australia a capability at that time not possessed by any land based air force operating jet aircraft in the region. The Great Australian Bight lived up to its reputation as a rough sea with Melbourne enduring a heavy swell during her passage east for a four-day visit to her namesake city, Melbourne. Here the new aircraft carrier was again warmly greeted and a civic reception was held in honour of the occasion at the Melbourne Town Hall. The final leg of her voyage ‘home’ was via Jervis Bay where the sixty-four aircraft that Melbourne had brought from the U.K were transferred ashore via lighter for road transport to the Naval Air Station at Nowra. Finally on 9 May she arrived in Sydney for the first time. Thousands of people turned out to watch her arrive in the harbour and three days later she replaced HMAS Sydney (III) as the flagship of the RAN when Rear-ADML H.M. Burrell ‘broke’ his flag in her. Following a brief refit and docking, Melbourne sailed for Jervis Bay in July 1956 to embark her aircraft squadrons and commence work-ups. She then sailed for Brisbane and the Hervey Bay area. During day flying operations she lost her first aircraft, a Sea Venom that ditched following a catapult launching. Sadly, the pilot and observer did not survive. In August she assisted in the search for survivors from the wreck of the collier Birchgrove Park and in September sailed for what was to be the first of many deployments to South East Asia. The Australian Government had by this time committed naval forces to what became known as the Far East Strategic Reserve, which provided for an annual visit from an aircraft carrier as part of the RAN‘s contribution. Melbourne maintained this commitment with the Strategic Reserve and later with ANZUK forces, participating in many exercises conducted under the auspices of the South East Asia Treaty Organisation (SEATO). In November/December 1956 Melbourne again visited Port Melbourne where she contributed to the staging of the 16th Olympiad. The Flagship band was part of the RAN massed bands that gave an extremely polished display in the main stadium as a prelude to the official opening ceremony. Every day Melbourne provided some 200 personnel to act as marshals in various stadia, additionally, signalmen, carpenters and sick berth attendants were utilised to perform special duties. Early in 1957 Melbourne visited Hobart before crossing the Tasman to participate in exercises with the New Zealand cruiser HMNZS Royalist. On completion of these exercises she made port visits to both Wellington and Auckland before returning to Sydney to replenish. On 18 March Melbourne deployed for a five month deployment that saw her circumnavigate Australia and visit numerous S.E. Asian countries. On returning to Sydney in July she commenced a refit and leave period before sailing again for work-ups in September. The remainder of the year was spent exercising in Australian waters before returning to Sydney for Christmas leave. The remainder of the 1950’s and early 1960’s followed a similar cycle with Melbourne deploying for lengthy periods of time throughout Asia and the Pacific before returning home for refit and respite for her crew. During these deployments she participated in numerous exercises with regional navies, the United States Navy (USN) and RN. In 1962 twenty-seven Westland Wessex anti-submarine helicopters were purchased when it was planned to employ Melbourne purely in an anti-submarine role. However this decision was later reversed. On 10 February 1964 Melbourne was involved in a collision with the Daring class destroyer HMAS Voyager (II), off the New South Wales coast whilst engaged in night flying exercises. Voyager (II) was cut in two and sank with the loss of 82 lives out of her complement of 317 when she crossed Melbourne‘s bows whilst manoeuvring to taking up station. Melbourne sustained significant damage to her bow that resulted in major repairs being undertaken at Cockatoo Island Dockyard in Sydney. Subsequent findings cleared Melbourne from any blame. With her damaged bow repaired Melbourne sailed in June and continued her cycle of exercising in S.E. Asian waters over the next two years. In 1965 a decision was made to purchase eight A4G and two TA4G Skyhawk jet fighters and fourteen Grumman S2-E Trackers from the United States to maintain Melbourne‘s existing capability. The total cost of the new aircraft was $46 million. In June 1965, and twice in May 1966, Melbourne escorted her sister ship Sydney (III) into Vietnamese waters. Sydney (III) had by now been converted to a Fast Troop Transport and was routinely engaged in transporting Australian military personnel to and from Vietnam between 1965 and 1972. In September 1967 Melbourne sailed to the United States where she embarked the newly acquired Douglas A4 Skyhawk and Grumman S2-E Tracker aircraft, returning to Australia in November of that year. 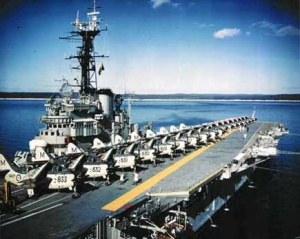 To operate the new aircraft Melbourne required a major refit and consequently underwent a lengthy modernisation at HMA Naval Dockyard, Garden Island, between December 1967 and February 1969. The refit incorporated a communications upgrade and a new radar suite consisting of both Dutch and US radars. The British Type 293 surface search set was retained and a single LW-02 air-surveillance scanner was installed over the bridge. Abaft the funnel an SPN-35 carrier-controlled approach scanner was mounted within a dome and on the lattice mast a TACAN aerial and ECM pods were mounted. 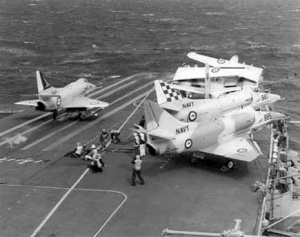 Melbourne recommissioned on 14 February 1969 and sailed from Sydney for the Far East on 5 May 1969 with 805 Squadron (Skyhawks), 816 Squadron (Trackers) and 817 Squadron (Wessex helicopters) embarked. Tragedy struck Melbourne again in the early hours of 3 June 1969 during the SEATO Exercise SEA SPIRIT, when USS Frank. E. Evans crossed her bows and was cut in two in an incident all too similar to that of Voyager (II) five years earlier. The forward section of the Frank E. Evans sank with the loss of 74 lives and Melbourne sustained extensive damage to her bow section. Repairs were once again carried out at Cockatoo Island Dockyard in Sydney and on completion Melbourne resumed her exercise and training commitments. Melbourne was again cleared of blame in relation to this incident. The Flagship deployed extensively throughout 1970 and visited Osaka, Japan, for Australia’s National Day at the EXPO 70 exposition where her band participated in the ‘Waltzing Matilda Review’. Following this visit Melbourne participated in a variety of exercises in the Far East with units of the RAN, RN and other regional navies. In December 1970 her three squadrons were disembarked and she commenced another major refit at Garden Island during which her flight deck was strengthened and her catapult rebuilt with a bridle catcher extension. During the same year an additional eight A4-G and two TA-G Skyhawk aircraft were delivered. In August, following nine months in dockyard hands, Melbourne re-joined the fleet and sailed for shake down and work-ups off Jervis Bay. In September she embarked her Carrier Air Group (CAG) consisting of 805, 816 and 817 Squadrons and sailed in October to participate in exercises off Hawaii in November. She returned to Sydney on completion for leave, maintenance and storing. On 27 January 1972, Task Group 327.2 consisting of HMA Ships Melbourne, Hobart, Duchess, Stalwart (II) and Supply departed Sydney for Subic Bay in the Philippines to participate in Exercise SEA HAWK and subsequent ANZUK exercises. Numerous S.E. 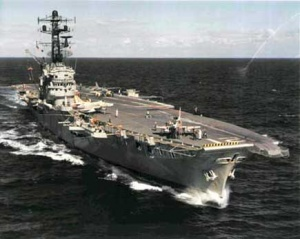 Asian ports were visited during this deployment including Manila, Hong Kong, Singapore and Djakarta before the carrier returned to Sydney via Fremantle on 26 April 1972 having steamed 15,933 miles since her departure from Sydney. Between June 1972 and January 1973, Melbourne was continually involved in further training and exercises including Exercise RIMPAC 72 in the Hawaii Operations Area (HOA). On completion of RIMPAC she proceeded to Yokosuka, Japan before participating in Exercise SEA SCORPION held off Corregidor in the Philippines. Melbourne returned to Australia on 27 November, via Manila and Singapore having been deployed for 101 days. From January to July 1973 Melbourne underwent a minor refit at Garden Island in preparation for another deployment to Pearl Harbor. On 24 August she sailed in company with HMA Ships Brisbane and Stuart and all three ships received a warm welcome on their arrival in Hawaii for Exercise RIMPAC 73. She returned to Australia in October for a short turn around before deploying for S.E. Asia to take part in the ANZUK Exercise LEADLINE. Further exercises and training periods followed during 1974, with the Flagship again visiting Pearl Harbor before proceeding to Los Angeles California, USA where relics of the Pacific War were delivered on behalf of the Australian Government for presentation to the Admiral Nimitz War Museum at Fredericksburg, Texas. Melbourne‘s next port of call was San Francisco where she embarked a consignment of Chinook helicopters for delivery to Brisbane on her return voyage. On arrival in Sydney in April she underwent a self maintenance period (SMP) before working up prior to participating in Exercise KANGAROO ONE which involved sea, land and air forces from Australia, Britain, the United States and New Zealand. After a busy year the carrier returned to Sydney for maintenance and a well earned leave period. On 26 December 1974, the day after Darwin was devastated by Cyclone Tracy, Melbourne’s ships company were recalled from Christmas leave and she ‘crash’ sailed from Sydney carrying vital supplies to assist in what became known as Operation NAVY HELP DARWIN. She remained in the Darwin area until 18 January 1975 at which time she returned to Sydney to carry out pre-deployment preparations for Exercise RIMPAC 75 which was held in the Hawaii Operations Area in March. In April 1975 the Skyhawks, Trackers and Wessex helicopters of 805, 816 and 817 Squadrons were flown off in preparation for a major refit at Garden Island, where Melbourne remained until 21 June 1976. 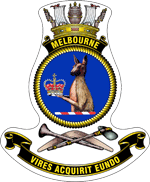 On 4 August 1976 Melbourne‘s Carrier Air Group, comprising 805, 816 and 817 Squadrons, re-embarked and she participated in training and exercises until 11 October 1976 when she deployed to the Shoalwater Bay area for Exercise KANGAROO II during which she flew 567 fixed wing aircraft sorties. Following this exercise, the Governor-General, the Honourable Sir John Kerr AK GCMG KStJ QC and Lady Kerr took passage in Melbourne from the Naval Air Station, Nowra, to Melbourne to take part in the ship’s informal 21st Birthday celebrations on 28 October. On 31 October 1976, a Sea King helicopter from Melbourne assisted in the rescue of a hang glider pilot at Hall’s Gap, north of Melbourne. On 1 and 2 December, 13,500 citizens of Melbourne visited the Flagship before she proceeded for Sydney once again disembarking her Carrier Air Group en route. In February 1977 Melbourne again sailed for Pearl Harbor to participate in Exercise RIMPAC 77. On completion of the exercise she sailed to San Diego where she embarked replacement S2G Grumman Tracker aircraft to replace those that were destroyed in the hangar fire at HMAS Albatross on 4 December 1976. In May 1977 Melbourne, in company with the guided missile destroyer Brisbane, departed Australia for the United Kingdom to take part in the Spithead Naval Review commemorating the Silver Jubilee of Her Majesty Queen Elizabeth II. Passage to the United Kingdom was via Colombo, the Suez Canal, Crete and Gibraltar and this provided many of her ships company with opportunities to enjoy exploring many previously unseen ports. Following a successful and memorable visit to the U.K Melbourne participated in Exercise HIGHWOOD in July 1977 before returning to Australia via Naples, Port Said, the Suez Canal, Bombay and Singapore. The Flagship docked in the Captain Cook Graving Dock at Garden Island on her return to Sydney in October 1977 and remained there undergoing maintenance until January 1978. On completion of the maintenance period Melbourne again commenced work ups prior to deploying to Pearl Harbor for Exercise RIMPAC 78. On her return to Australia in May, the ageing aircraft carrier commenced a lengthy refit that completed in April 1979. In August 1979 Melbourne visited New Zealand to take part in Exercise TASMANEX. This was followed by Exercise SEA EAGLE in September and Exercise KANGAROO III in October which capped off another busy year for the Flagship. In February 1980 Melbourne deployed to Hawaii to participate in what was to be her last Exercise RIMPAC. She returned to Australia in March and underwent a refit from April to July 1980. In September 1980 she led a Royal Australian Navy task force into the Indian Ocean, the largest and longest Royal Australian Navy deployment to the area since World War II. During this deployment the venerable aircraft carrier celebrated 25 years in commission. Returning to Australia in November 1980 Melbourne remained in Australian waters until May 1981 when she sailed for South East Asia, returning in July. On 14 June 1981 Melbourne, in company with HMAS Torrens, rescued a group of 99 Vietnamese refugees in the South China Sea and saw further service in Australian waters, participating in Exercises SEA EAGLE and KANGAROO 81. In February 1982 the Australian government announced that arrangements had been made to purchase the British Invincible class aircraft carrier HMS Invincible from the Royal Navy to replace the ageing Melbourne. With her days now numbered the carrier entered a period of self maintenance in Sydney from which she was destined never to emerge. HMAS Melbourne was decommissioned on 30 June 1982, having spent 62,036 hours underway and having steamed 868,893 nautical miles. The purchase of the Royal Navy carrier Invincible was subsequently cancelled when the British Government decided it was necessary to retain the aircraft carrier following lessons learned during the Falklands war. In March 1983 the incoming Australian Labor Government announced that it would implement its election commitment not to replace Melbourne and as a result of these two decisions the RAN lost many of the advantages it had hitherto enjoyed in the region. Melbourne spent her last days moored at Bradley’s Head dolphins in Sydney Harbour, awaiting a decision on disposal. The ship was initially sold in June 1984 to an Australian company for A$1.7 million, however the sale fell through. In February 1985 the former Flagship was sold to the China United Shipbuilding Co Ltd for A$1.4 million to be broken up for scrap metal in the port of Dalian, China. Armament: 25 x 40mm Bofors, Sea Venom fighters, Sycamore helicopters, Skyhawk fighter-bombers, Sea King anti-submarine helicopters, Gannet anti-submarine aircraft, Wessex anti-submarine helicopters, Tracker anti-submarine aircraft.